The three keys to reducing your parent’s fall risk are muscular strength, balance, and flexibility. For this article, we will focus on the idea of flexibility in the elderly and why this is a key preventative measure to reduce their risk of falling. To maintain healthy functional movement, it is essential that your parent keeps flexible. Flexibility in their hip and ankles is needed to control motion, especially when getting into a bathtub or maneuvering stairs where falls often occur. Without flexibility, everyday physical activity for seniors can become increasingly more difficult to perform—and in some cases, dangerous or impossible. As your mom ages, she may use her legs and arms less which can cause tightness and a loss of elasticity. This can impair normal joint movement and restrict the normal lengthening and shortening of muscles which reduces their range of motion. For your mom to remain active and independent, stretching is critical to offset the effects of a normal decline in the flexibility of her joints. How can you help your mom be more flexible? Flexibility is the measuring of the range of motion of joints. This range of motion is impacted by the health of the muscles, tendons, and ligaments around a joint. There are also medical conditions, such as arthritis and osteoporosis, that can impact join movement which often comes with age. If your mom is having issues with flexibility and stiffness, discuss this with her physician. 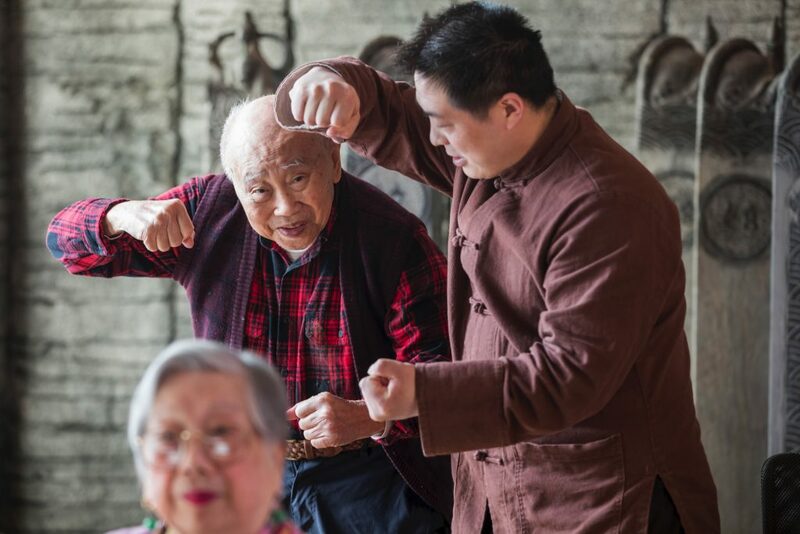 They will be able to make recommendations whether your mom is healthy enough to join a senior yoga class, Tai Chi for seniors or other elderly exercise program. Her doctor may also recommend that your mom meets with a physical therapist who can measure her flexibility. The goal of a physical therapist is to restore her physical ability to function independently. Therapists understand how the body should move and will work with your mom on strengthening her muscles and appropriate stretches to regain flexibility. They can also assess how well your mom is able to perform the tasks of daily living or if she needs assistance. We suggest that you do not start a stretching or elderly exercise program without first consulting with your parent’s physician. Flexibility is not determined solely by a person’s age. Your aging parent can adopt a fitness routine and exhibit great flexibility despite their advanced age. Stretching is the ideal way to improve blood circulation, reduce symptoms of disease, help one to relax, reduce pain, and promote a feeling of overall well-being. Research has found that stretching can be particularly beneficial to those who suffer from arthritis, Parkinson’s disease, and multiple sclerosis. Ask your local Aegis Living Life Enrichment Director for more information about the activities for seniors that may diminish falls.